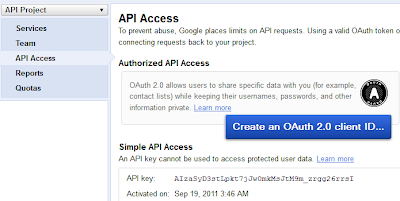 OAuth is currently the recommended standard for user authorization. 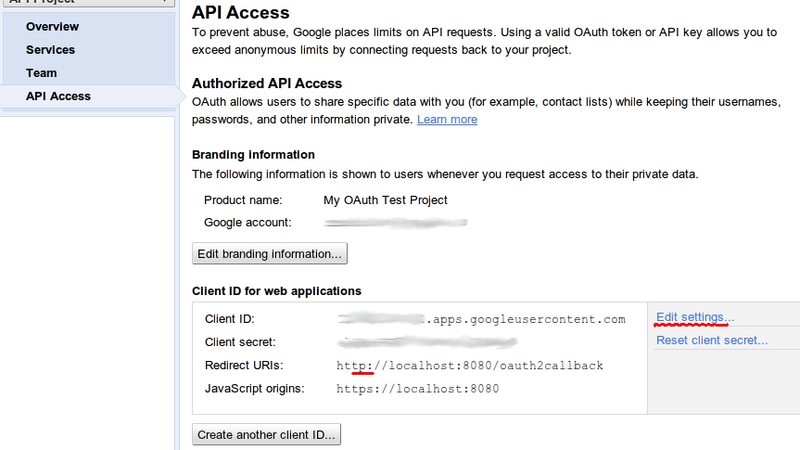 I’ll limit this write up to just examples of using the OAuth standard with Google using Go. However there are a lot of good write ups on the web that explains the process well. One of the major uses of OAuth is that a user can authorize your application, using a 3-legged authorization mechanism, to access his/her data from another service without giving you his authentication details. The authentication details are usually one’s username and password but it could be more - additional verification mechanisms like a finger print scan or a retina scan or what have you. I’ll illustrate the intended flow of 3-legged OAuth with a simplified real-world example. The setting for this story is: user X wants an online application Printr to print a his/her which is in another application called Photor. 1. User X to Printr: "Please print this photo of mine which is currently with Photor." 2. Printr to Photor: "Please grant me access user X’s photo." 3. Photor to user X: "Dear X, Printr is requesting access to your photo. If you are ok with that, can you please authorize it? Here is a webpage given by us where you can Accept or Deny this." 4. User X: "I want Printr to access that picture. Here, I Accept." 5. Photor to Printr: "User X accepted, so here, take this ‘code’ for now." 6. Printr to Photor: "Thanks for this code. Can you now give me a temporary token?" 7. Photor to Printr: "The code that Printr has returned seems legitimate and the user has agreed to grant access. Here, now take this ‘token’ with which you can access that photo." 8. Printr now accesses the photo using the token and prints it for user X. In the above transaction, you can see that only one application (Printr) has access to the user’s credentials, but he is willingly sharing some part of his data with chosen applications, which is a plus for security, apart from reducing redundancy like having separate copies of the same photo with different applications and also managing all the separate user accounts and passwords. In this tutorial, we shall create a program that prints the user’s Google profile information. Most other OAuth providers processes will be similar, and are usually well documented on their developer pages. Step 1: Obtain Client ID and Client Secret codes for your application. 1. Go to https://code.google.com/apis/console. 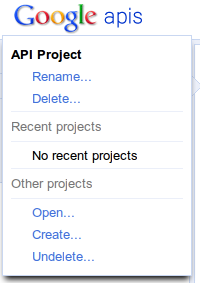 If you don’t have a project defined until now, you will see a screen asking you to start using the Google APIs. 2. Create a project by either choosing "Add Project" in the previous screen or "Create …" from the drop down menu. 3. The default name for your first project is "API Project". You can rename it if you wish, but the name does not matter for us, and for now we can just leave it as it is. 4. For your new project, there is a "Services" table that should have no entries. Leave it as it is. We are not going to access any of these services for our example. 5. We also won’t make any changes in the Team tab for our example. 6. In the "API Access" tab, click on the big blue "Create an OAuth 2.0 Client ID" button and follow the wizard with the default values until the end. 7. 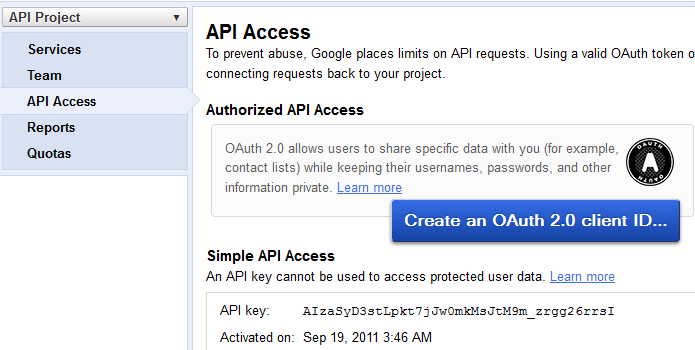 Your API Access screen should now look something like this. 8. 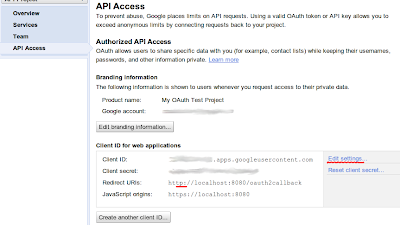 Click "API Access"->"Client ID for web applications"->"Edit Settings". Update the entry in the window as shown below. Notice that I have changed it from the default "https" to "http". At this point, you have a Client ID code and a Client Secret code which you have to use in your application. 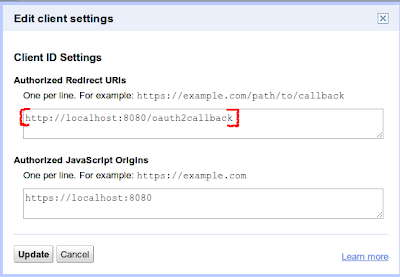 You also need to use the Redirect URI - this is the URI to which the Google server redirects the page to return your OAuth code. To understand how to work with goinstall please go through the other tutorial at go packages and go install. Here I shall just repeat the gist of the more detailed information on installing an external API from this other tutorial using external api in a go web program. Since the program is fairly long, I’ve included the comments along with the code. I’ve also removed all error checks and other code to make it small, which of course is not recommended. To get a gist of the program, here is the pseudocode. 3. When Google returns the authorization code to your URL, save the code. 5. Use the Transport which has the token to get the user details. You have currently not given permissions to access your data. Please authenticate this app with the Google OAuth provider. //TODO: This exact URL should also be added in your Google API console for this project within "API Access"->"Redirect URIs"
//This is the 'scope' of the data that you are asking the user's permission to access. For getting user's info, this is the url that Google has defined. My program file is called goauthweb.go and the oauth package I installed is at $GOPATH/pkg/linux_amd64. With that I compiled, linked, and executed the program as below on my 64bit Ubuntu machine. I tried to do the same thing with Facebook, which also supports OAuth2, but got internal server errors on callback. Any tips? Thank you Nagasai, I've updated that. 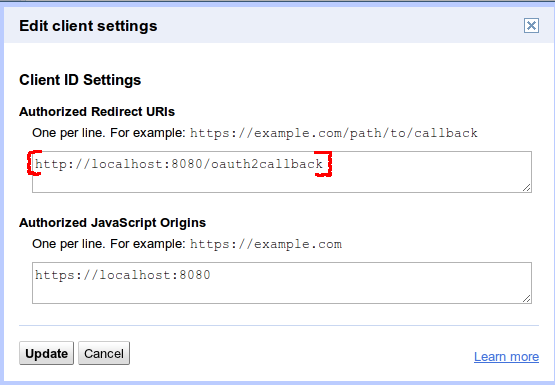 This seemingly breaks under Go 1.1 - when Google attempts to pass the token to the callback URL, the app panics. I've seemingly had a similar issue with another OAuth2 library—where it panics on return—which leads me to believe it's 1.1 causing the problem. Just to let you know this location has changed again making this out of date "code.google.com/p/goauth2/oauth"